How would Yuppiechef like proof of payment? If you would like to pay part or all of your order with a voucher, that is an option both on the “Cart” page as well as on the “Checkout” page. Yes, if your Debit card has a CVV number and an expiry date, as well as a Visa, Mastercard, Diners Club or American Express logo, you can use it to make your payment. The CVV Number (Card Verification Value) on your credit card or debit card is a 3 digit number on VISA® and MasterCard® branded credit and debit cards. On your American Express® branded credit or debit card it is a 4 digit numeric code that appears on the front of the card. We know this is a worry for some folk, especially first-timers. But, yes, they're safe. All credit card transactions take place on a secure page (your address bar will appear green) Our payment gateways only use the strictest form of encryption, namely Secure Socket Layer 3 (SSL3) and no credit card details are stored on the website. Once you have selected EFT as your payment option at the checkout click "order and pay now". The next page will have all our bank details for you to make the payment. If you have already passed this point then you will receive an order confirmation email once you have selected EFT as your method of payment. This email will have our banking details or refer to bank details listed above. Please make sure you use your YC order number as the reference number. 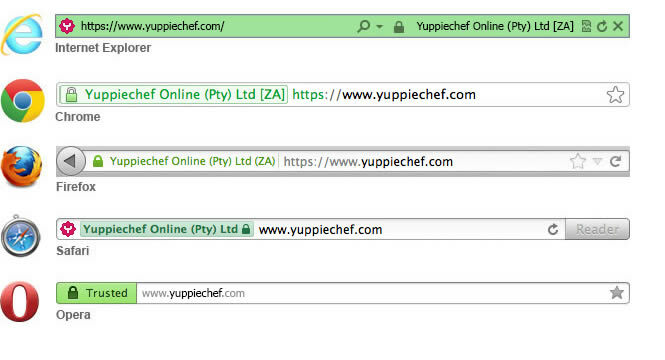 Send proof of payment to payments@yuppiechef.com and your payment will be processed within the next 2-3 working hours. We can only accept official bank generated PDF proof of payment. Unfortunately copied text will not be accepted. You can part pay with eBucks and pay the balance via credit card or EFT. When using Discovery Miles, you can part pay with your miles and pay the balance via credit card.